The fish pictured are not the exact fish you will receive. The fish you will receive will closely match the fish pictured in both variety and quality. Our most inexpensive and affordable grade of Koi. 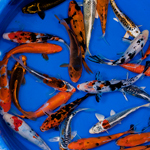 Standard Grade Koi contain a good mix of all of the common varieties and colors of Koi that we offer. Any colorless cull grade fish are removed. The perfect Koi for your novice or inexperienced pond customers. Available from 5 to 6 inches.